Bat for Lashes "I Do"
Natasha Khan seems to be stuck in a post-Valentine's Day stupor, as the musician has just unveiled a romantic new single under her Bat for Lashes moniker. The new song is titled "I Do," and marks the first new Bat for Lashes material from Khan since 2012's The Haunted Man, though she did release the self-titled debut from her side-project Sexwitch last year. 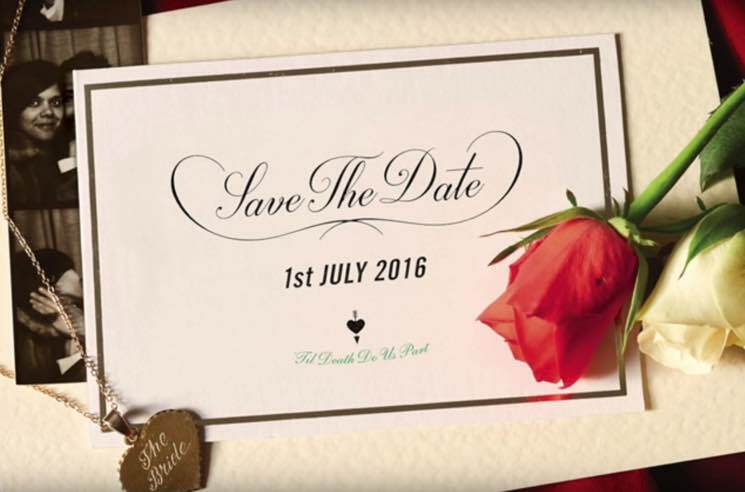 The track is accompanied by an equally romantically inclined image that features a save the date card for July 1 with the message "Til Death to Us Part" impeccably scrawled beneath it. There is also a heart-shaped necklace engraved with "The Bride" lying next to the invitation and pair of roses. While we wait for the cryptic hints to turn into a more solid report of things to come from Bat for Lashes, you can enjoy the whimsical, romantic new song in the player below.